​Many sincere Christians and others are led to think and claim that in our day God is speaking to His people through dreams, visions, special "gifts" of the Spirit and prophecies aside from those recorded in the completed Bible, whereas, as is evident from the following considerations from the Scriptures, these methods of Divine revelation ceased to operate shortly after the days of the twelve Apostles and the completion of the New Testament. The early Church, in its infancy, had only a part (the Old Testament part) of the Divine revelation for the Church. So in order to establish the early Church until "that which is perfect [complete, the full revelation, including all the New Testament] is come," God arranged for His consecrated children, His New Creatures in Christ Jesus, baptized with His holy Spirit, to have certain special "gifts" of the Spirit—such as Divinely inspired wisdom, knowledge, the gifts of healing, the working of miracles, prophecy, kinds of tongues (languages), or glossolalia, etc. (1 Cor. 12:8-10). "Charity [love] never faileth [never will cease]: but whether there be prophecies [obviously he did not mean Bible prophecies—which surely would not fail but would all be fulfilled—rather he meant the miraculous 'gift' by God's inspiration to publicly expound the Truth and, subordinately (as did Agabus—Acts 11:28; 21:10, 11), to forecast future events—v. 2], they shall fail [cease to be exercised as one of the Spirit's 'gifts'; the Greek verb katargeo, used here, means to be rendered entirely idle or useless, to bring to an end]; whether there be tongues [the miraculous 'gift' by God's power of speaking in other languages—v. 1], they shall cease; whether there be knowledge [surely not all knowledge, but the special 'gift' by God's power to know things—v. 2], it shall vanish away." Aside from the two general baptisms with the holy Spirit (Acts 2:1-11; 10:44-47; 11:15), the "gifts" of the Spirit came on the early Church ONLY through the laying on of hands by one or more of the twelve Apostles — after which only "they spoke with tongues, and prophesied" (Acts 8:14-18; 19:6). Therefore with the death of the last member of the early Church on whom one of the twelve Apostles had imparted a "gift" of the Spirit by the laying on of hands, these "gifts" of course passed away, as the Bible said they would (1 Cor. 13:8), and as history from the second century onward attests they did. Thus the Apostle explained (vs. 9-13): "For [during the Church's infancy] we know in [Greek, ek, from, out of, and therefore because of, on account of, a] part [the Old Testament was the only part of the Bible that had yet been given], and we prophesy in part [Christians in the beginning of the Gospel Age had these 'gifts' because the Bible had not yet been fully given; so the 'gifts' were given to supplement—temporarily—the Old Testament, the incomplete revelation for the Church]." V. 10: "But when that which is perfect [Greek, teleion, complete, entire, as opposed to that which is in part—in other words, the completed Bible] is come, then that [the 'gifts' of the Spirit] which is [exists] in [from, because of, a] part [only the Old Testament portion of the Bible having yet been given] shall be done away [Greek, katargeo: the 'gifts' were to be brought to an end—to fail, cease, vanish away—after the Bible's completion]." V. 11: The Apostle then uses himself as an illustration of the Church's early experiences: "When I was a child, I spake [alluding to tongues] as a child [compare 1 Cor. 3:1; 14:20], I understood [alluding to prophecy] as a child, I thought [reasoned, judged, alluding to knowledge] as a child: but when I became a man, I put away childish things [i.e., the 'gifts' of the Spirit, which pertained only to the early Church—the Church's childhood—and not to its manhood—its maturity]." 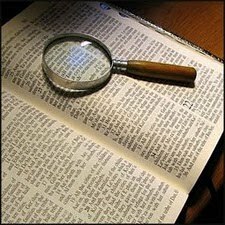 V. 12: "For now [in the Apostle's day] we [the Church] see through [Greek, dia, through] a glass [through a dim window—Rotherham; not our modern clear glass, but thin plates of horn, transparent stone crystals, etc. ; compare Rev. 4:6; 21:11; 22:1], darkly [Greek, en ainigmati, enigmatically, dimly, obscurely—see Diaglott footnote; God's revelation, the Bible, not being yet completed and only a part of that already fully given being clearly understood, gave but an obscure vision, so that the early Church could not know fully, as they were known by God, and could not understand clearly]; but then [when the written revelation, the Bible, would be completed by having the New Testament added] face to face [they would then have a clear understanding; and since the glass represented incomplete knowledge, the expression 'face to face' by contrast obviously is metaphorical for the state of completed knowledge, as far as God's written and revealed will is concerned. The face sometimes typifies or symbolizes knowledge—see Rev. 1:16; 20:11; thus when God 'spoke unto Moses face to face'—Ex. 33:11—Moses did not see Him face to face—Ex. 33:20; 'face to face' here means clearly, for God spoke to Moses, not in visions and dreams, as to other prophets, but in perfectly clear communications: 'mouth to mouth, even apparently (manifestly—ASV), and not in dark speeches' (ainigmaton—Septuagint)—Num. 12:6-8; Deut. 34:10]: now I [the Church] know in part [from a part—the Old Testament part—thus incompletely, compare vs. 9, 10]; but then [when the written revelation would be completed] shall I know [fully—so the Greek] even as also I am [have been fully—so the Greek] known [by God; not that Paul or any others of the Church would be given omniscience, but that the unclear glass condition—the supplementation of the Old Testament by the 'gifts' of the Spirit—ceasing with the completion of the New Testament, they would through the completed Bible—the 'face to face' condition of clear knowledge—know in full the character, plan and works of God as He reveals them in His completed Bible to His Church]." V. 13: "And [Greek, but—in contrast to the 'gifts' of the Spirit, which were soon to pass away] now [during the entire Gospel Age, when especially needed] abideth [a triad of three chief graces, in contrast with the triad of three temporary 'gifts' of the Spirit soon to pass away—v. 8] faith, hope, charity [love], these three [which stand for all the other graces of the Spirit as well, even as in v. 8 the three 'gifts' of the Spirit mentioned stand for all the other 'gifts' of the Spirit as well]; but the greatest of these [abiding graces] is charity [love]." In view of the above Scriptures and the teachings of God's Word in general, obviously those who claim for themselves or for others any of the special "gifts" of the Spirit, such as, e.g., the "gift of prophecy," with communications from the spirit world, are greatly deceived, and are apt to serve Satan unwittingly. Because (1) the miraculous "gifts" of the Spirit, such as "the word of wisdom," "the word of knowledge," "the gifts of healing," "the working of miracles," "prophecy," "kinds of tongues [languages]," etc., were given to the early Church for her establishment during the time when she had only a "part" (the Old Testament part) of the Divine revelation intended for the Church (1 Cor. 12:8-10; 13:9-12); because (2) these "gifts" of the Spirit were (aside from the two general baptisms—Acts 2:1-11; 10:44-47; 11:15) bestowed on the early Church only through the laying on of hands by one or more of the twelve Apostles (Acts 8:14-18; 19:6), and there­fore could not (and did not) continue beyond the second century; because (3) the Bible tells us plainly that these "gifts" of the Spirit were only for the early Church, when she could "know" and "prophesy" only "in part," but that "when that which is perfect [the completed Bible] is come," these "gifts" would be brought to an end—fail, cease, vanish away—though the graces of the Spirit would still abide (1 Cor. 13:8-10, 13); and because (4) we now have the completed Word of God for the Church, both the Old and the New Testaments ("all Scripture given by inspiration of God," which is "profitable for doctrine, for reproof, for correction, for instruction in righteousness: that the man of God may be perfect [Greek, artios, completely fitted], thoroughly furnished unto all good works"—2 Tim. 3:16, 17), and therefore have no more need of dreams, visions and other extra-Biblical means of Divine revelation, but have "a more sure word of prophecy; whereunto ye do well that ye take heed, as unto a light that shineth in a dark place, until the [Millennial] day dawn, and the day star [our Lord Jesus—Rev. 22:16] arise in your hearts" (2 Pet. 1:19) — because of these four and other Biblical reasons, we are forced to the conclusion that all who now claim that they have a "gift" of prophecy from God, and who use crystal balls, fortune-telling (tarot) cards, dreams, visions, séances, "inner voices," or occult "impressions" from "spirit-powers," etc., in prophesying future events and conditions, are inspired, not by God, but by Satan and his evil spirits, his demons, whether they recognize them as the sources of their information or not. This points out as "false prophets" all who prophesy in harmony with Satan's deceptions and his original lie (that the dead are not really dead but are still alive—Gen. 3:4) and who speak not "according to the law and to the testimony," which includes also the New Testa­ment (Isa. 8:19, 20). This clearly manifests as "false prophets" such visionary "prophets" as Joseph Smith, Emanuel Swedenborg, the Fox sisters, Mary Baker Eddy, Edgar Cayce (see our booklet on Faith Healing, a copy free on request), Norman Vincent Peale (see our booklet Spiritism is Demonism, a copy free on request), Jeane Dixon and many others who teach Satan's lies and use his devices in making their prophecies. Our Lord forewarned (Matt. 24:11) that "many false prophets shall rise, and shall deceive many," and that they shall show "great signs and wonders; insomuch that, if it were possible, they shall deceive the very elect" (v. 24). As noted above, it is especially in these "latter times" that many are "giving heed to seducing spirits, and doctrines of devils" (1 Tim. 4:1). Mrs. Dixon is one of the most widely heralded and influential prophets of today. Many believe that God is really speaking through her and that her professed "gift of prophecy" is a special gift from Him. She has made some very remarkable and accurate predictions that give sure evidence of superhuman intelligence as their source. Mrs. Dixon has a charming personality; she attributes her "gift of prophecy" to God, and claims to rejoice in the thought that she may be used by Him in bringing blessings to others. She does not accept pay for her prognostications. She seems to be very sincere, and we would not to the least extent condemn the good motives of her heart. It is for the protection and spiritual welfare of our readers that we here expose her and other modern-day "prophets" who speak not "according to the law and to the testimony," as being in reality "false prophets," in the service of Satan and his demons, even though in many cases deceived into believing that they are really serving the Most High God. But some may ask, How can Mrs. Dixon be a false prophet when so many of her predictions have come true? We agree that she has scored a remarkably good average. In fact, about 60% of her predictions have come true, and some of these in remarkable detail—as, for in­stance, her prediction of the assassination of President Kennedy, giving the place and date of his death and the name of his assassin. But why ascribe her revelations from the spirit world to God and His good angels instead of to Satan and his demons, who of course knew of the plot and many details connected with the murder of President Kennedy and thus could reveal them to Mrs. Dixon through her crystal ball, her "impressions," her dreams and visions, etc.? Obviously, a prophet who speaks under the inspira­tion of God's holy Spirit will not give a false prophecy—not even once. False prophets among God's people in Old Testament times were to be put to death: "The prophet, which shall presume to speak a word in my name, which I have not commanded him to speak, or that shall speak in the name of other gods, even that prophet shall die. And if thou say in thine heart, How shall we know the word which the LORD hath not spoken? When a prophet speaketh in the name of the LORD, if the thing follow not, nor come to pass, that is the thing which the LORD hath not spoken, but the prophet hath spoken it presumptuously: thou shalt not be afraid of him"—not regard him as a true prophet (Deut. 18:20-22). "World War III will break out in Oct. 1958, over Red China's attempt to seize Quemoy and Matsu." "Red China will be admitted to the United Nations in 1959." "Richard Nixon will defeat John F. Kennedy in the election of 1960." "Davis Strait (between Canada and Greenland) will become strategically crucial to the U.S. in 1963." "President Charles de Gaulle will surrender his powers in 1964." "Walter Reuther will be a Democratic candidate for President in 1964." When Jeane was eight years old, her Roman Catholic father suggested that her mother take her to consult with a nearby gypsy fortune-teller in California. The gypsy forecast for Jeane a brilliant future, saying that she had unusual sensitivity and would grow mightily in wisdom, and because of her gift of prophecy would foresee world-wide changes and become very famous. She gave to Jeane a crystal ball, saying, "It's for you to keep; you will be able to meditate on this and see wonderful things in it, for the markings on your hands are those of a mystic." For some time Jeane used her crystal ball merely as a plaything, supposing that anyone could see pictures in it, even as she did; but her mother took care of it and encouraged Jeane to use her strange talent. As she did so, her psychic abilities increased. Soon after the family moved to Los Angeles her fame spread and friends and strangers came, asking her to forecast their future. Jeane usually consulted her crystal ball, though sometimes her fortune-telling was aided by cards. She treasures a worn deck of tarot cards, which her gypsy for­tune-teller had given her with the crystal ball. She claims that because the gypsy had blessed them they carry "good vibrations" and help her to get the subject's vibrations when he shuffles and touches them. As she practiced her art her ESP and visionary powers increased. Sometimes she merely "tips the fingers" of a person or gets their vibrations by other means and knows at once things pertaining to that person's future. By learning merely the date of one's birth, she can often pinpoint events in the past and future for people she has never seen. MRS. DIXON'S VISIONS OF A SERPENT, ETC. Mrs. Dixon states that as the serpent grew in size, it turned its head and gazed into her eyes. She says, "In them was the all-knowing wisdom of the ages. Although the room had been in almost total darkness, it was now bathed in brilliant light. The snake, vividly colored in yellow and black, had great jowls shaped like miniature pyramids. It did not speak, but I seemed to know it was telling me I had much, much to learn. It turned its head, looking again to the east and then to me, as if to say that I too must look to the east for God's wisdom and guidance. I sensed it was telling me that if my faith was great enough I could penetrate some of this divine wisdom. I knew I had God's protection, for the steady gaze of the reptile was permeated with love, goodness, strength, and knowledge. A sense of 'peace on earth, good will toward men' coursed through my being. I had a feeling of suspension and yet of stability. A purplish ray led from the bed to the window at the east, and as I watched, the snake gradually withdrew toward my feet." Mrs. Dixon claims that her next vision (see A Gift of Prophecy, p. 175) came as she was in St. Matthew's Cathedral choosing "ten purple containers in which she was preparing to burn candles for intentions, and she had reached into her purse for coins when she found her hands entangled in a mass of purple and gold balls. As she gazed in awe, the small balls floated upward and gradually emerged into a mass of purple discs edged in gold, encircling the knees of the statue of the Virgin Mary, rising gently until it enveloped her breast and head like an uptilted halo." She analyzes this vision as follows: "The Holy Mother's face came alive … suddenly brilliant rays shone on every imaginable people and religion. The cathedral overflowed with peasants in babushkas, kings and queens in royal raiment, the rich and the poor of every nationality and creed. I could not see a single vacant pew. Everyone was bathed in the same sunshine, and I seemed to be standing on something as soft as new-fallen snow. A remarkable peace overcame me, and I knew that a council of our Church would soon bring together under the roof of the Holy See in Rome, the religions and nationalities of all the world." In summarizing this vision to a friend, she said: "Our Church is going to call a great council of all faiths and creeds. Peoples from every land will be repre­sented, and eventually, all religions will be brought to­gether under one sun. Our Holy See in Rome is going to start the trend." Mrs. Dixon tells of another vision she had while she was kneeling in prayer in St. Matthew's Cathedral, holding a crystal ball in her hand. She says that there appeared before her a vision of the Holy Mother "draped in purplish blue and surrounded by gold and white rays which formed a halo of light around her entire person. … Off to one side I was shown a Pope with blood running down his face and dripping over his left shoulder. … I saw hands reaching out for the throne, but no one sat in it, so I realized that within this cen­tury a Pope will be bodily harmed. When this occurs, the head of the Church will thereafter have a different insignia than that of the Pope. Because the unearthly light continued to shine so brightly on the papal throne, I knew that the power would still be there but that it would not rest in the person of a Pope." Of course, the Bible describes, especially in the book of Revelation, in much greater detail and far more accurately, the overthrow of symbolic Babylon and the papal power. How foolish and how dangerous it is to go to Satan, his evil spirits and their human agents for information, which is often very deceptive, and not instead to trust fully in Jehovah and His superior wisdom! We cannot imagine the Lord's true servants resorting to such methods as crystal balls, tarot cards, ouija boards, séances, table-tippings, table-rappings, horoscopes and lucky days in determining God's will. We should steadfastly avoid consulting with soothsayers, fortune-tellers, diviners, witches, necromancers, observers of times, charmers, or consulters with familiar spirits, all of which are under God's condemnation (Deut. 18:10-14).